Diabetes Social Media Burnout blog Day - Join in and reignite your Diabetes Social Media spark! Burnout - It�s a very real thing - in life and life with diabetes - Burnout is also real when it comes to Social Media and the Diabetes Online Community. 3. Connecting with others who "get it," saves our sanity 93% of the time but has the ability to makes us bonkers at least 7% of the time. Sidebar: My math skills aren't the greatest and I've pulled those numbers out of my head and FTR, they have no scientific value. Diabetes Social Media Burnout has been the reason my blog has been quiet the past couple of weeks - Things were getting crazy with life, but more than that, I needed a diabetes Social Media timeout - both mentally and physically. I needed to take a beat and regroup - more on that tomorrow. 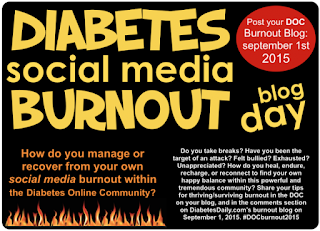 Speaking of tomorrow, Tuesday September 1 is the designated day that the Diabetes On-line Community will officially celebrate Diabetes Social Media Burnout Blog Day, a.k.a., #DOCburnout2015 on the twitter. A day where we can talk about and tackle our diabetes Social Media burnout, discuss ways we can regroup, re-fuel, and refocus our energies. 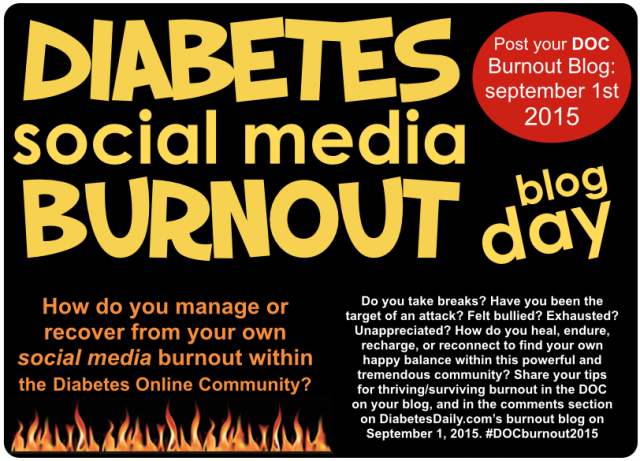 Diabetes burnout combined with Diabetes Social Media burnout and general feelings of malaise. I�ll be participating and I�m looking forward to reigniting my Diabetes Social Media spark, via learning from my community (YOU,) that has given me so much. Also, the very act of writing this blog post is making me feel a bit sparkly, already!